In today’s countries of east European, most of the brides wear white wedding dresses on their big days. Besides it, there are also many traditional wedding customs in east European and let us to get an acquaintance. On the basis of tradition Latvia wedding, the bride cannot change her marriage outfit until midnight when she will leave her mother and become a married woman. Before her leaving, she should remove her veil and give it to an unmarried girl. Once she removes her veil, it means her bride’s role ended. Later, she will wear a kerchief or hat made by her relative, which means she is not a bride any more but become someone’s wife. Some brides wear garland of veil and flowers on her head. In many European countries, the bride is deemed as symbol of lucky. In the ancient times, the guests who attend the party really tear a piece of dress from the bride in order to get a little luck. Today the custom that people tear the bride’s flower is evolved from that. The other custom that takes away goods from the bride’s body can be traced back to long time ago. At that time, the brides are hijacked or purchased by their grooms symbolically. For instance, on the Croatia’s wedding, the guests would try to steal the bride’s shoes. Then the groomsman has to pay money for the shoes and give back to the brides. 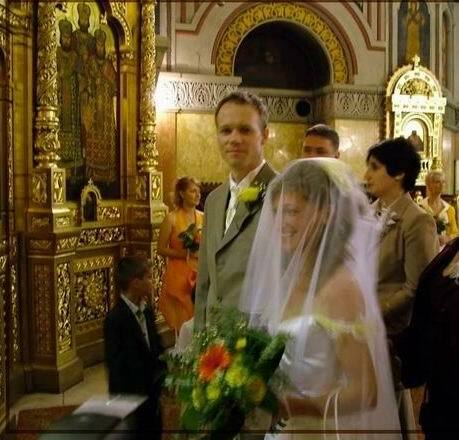 There is a custom on Serbs’ wedding: the bride’s mother-in-law should send a necklace made by gold coins to the bride. Now this present has been replaced by stocking and a pair of corpulent shoes. May be this kind of present is used for reminding the bride: from that big day on, she will have to become a busy wife. There is a ceremony of wearing pileum on the traditional wedding of Romania, Turkey, Georgia and Armenian. On the Romania’s wedding, the minister usually puts corolla made by gold and mysterious tree on the bride and groom’s heads. In addition, he would interchange their pileums three times as symbolizing their combination. In Georgia, the new couple should wear veil and a garland. According to the Armenian’s tradition, the bride and groom should wear the pileum for a week after wedding. When referred goods put on the new couple’s head, it is exactly a cake. In Russia’s three wedding days, the bride can wear all kinds of goods on her head, such as veil, pileum, satin, fragment and so on. On the wedding eve party, people would stirring barley and oats together and put them on the bride and groom’s head. On the wedding day, the minister holds up the new couple’s heads and the statue of their patron saint and then put the garland made with rue and vermouth on their heads. After that, he sprinkles hops on the bride’s head as a symbol of improving her fertility. So the wedding is over.